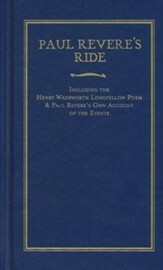 This thin book features the full text of Longfellow's Paul Revere's Ride, as well as a letter from Revere containing his memories of Lexington. 30 pages, hardcover, stamped-gold title. Bring children into the world of Longfellow's most famous poem with this unique picture book. 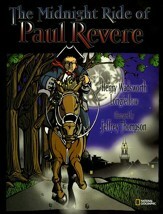 Pairing scratchboard-and-digital illustrations alongside stanzas from the poem "The Midnight Ride of Paul Revere," children will become familiar with this classic work. Historical note included. Ages 6-9 / Grades 1-4. 32 pages, softcover. Here is one of the most stirring poems in American Literature, brought vividly to life in this breathtaking new edition by a master of picture-book illustration. 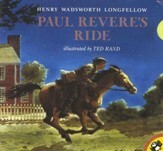 Ted Rand's moonlit vision captures the swift, rhythmic gait of Longfellow's words and the drama of Revere's brave ride as he gallops from town to farm, sounding the call to rise and arm against the British. The story unfolds in memorable pictorial images: Revere's anxious wait on the shore, the two lights in the belfry of the Old North Church, Concord Bridge in the early morning hours. The mixture of history, art, and poetry results in a book as gorgeous to behold as its message is inspiring to all who love freedom. Recommended for ages 6 to 9. Ten full-color postcards on perforated stock illustrate Longfellow's poem immortalizing Paul Revere's historic 1775 ride from Boston to Concord to warn the American colonists that British troops were on the way. The complete poem is included in the back of the book. 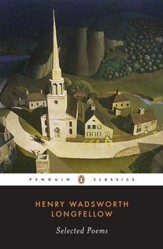 Henry Wadsworth Longfellow's 1855 classic is regarded as a masterpiece of American literature, combining romance and idealism in an idyllic natural setting. 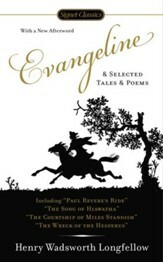 Included is the complete Evangeline as well as many of Wadsworth's other well-known poems; "The Skeleton in Armor," "The Arsenal at Springfield," "Mezzo Cammin," and "Aftermath." Choice collection reflects the poet's mastery of a rich variety of poetic forms and meters. Included is one of his best narrative poems, The Courtship of Miles Standish, along with such famous works as "The Village Blacksmith," "The Wreck of the Hesperus," "The Children's Hour" and "Paul Revere's Ride." 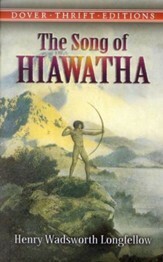 Reprinted from standard edition. Alphabetical lists of titles and first lines. Paperback, 85 pages. A collection that restores Longfellow's reputation as an important and influential American poet. 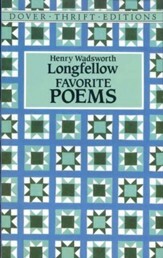 The most popular poet of his day, Longfellow has, unfortunately been discredited by posterity. This generous sampling of his work will give modern-day readers new insights into his long-neglected literary reach and versatility. 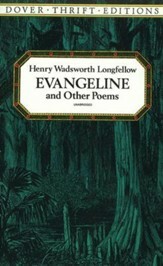 Longfellow's most familiar poems, the bold recreations of colonial life "Evangeline" and "The Courtship of Miles Standish," are here, as well as less familiar short lyrics and narrative poems. Differing in tone, style, and theme, the works provide a full and authentic picture of Longfellow's sense of himself, and his understanding of the true state of the times in which he lived.